During his mandatory army service he began collaborating with Israeli writer Etgar Keret. In 1997 a collection of Etgar’s stories illustrated by Asaf was publish under the title “Streets of Rage”. Their second collaboration “Pizzeria Kamikaze” was nominated for Eisner awards in 2007 and translated to English, French and Spanish. He collaborated with French writer Didier Daeninckx on “Carton Jaune!” in 2004 Published in France. Together with his twin brother Tomer, he co-created Bipolar, an experimental comic book series which was nominated for the Ignatz awards. Tomer and Asaf have created together “The Dirties”, a short narrative available on line. 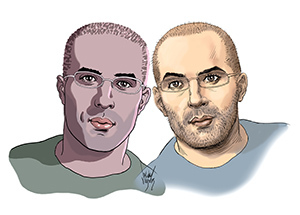 They currently collaborate on a graphic fiction called “The Divine”, written by Boaz Lavie, to be released in 2015 in both English and French. 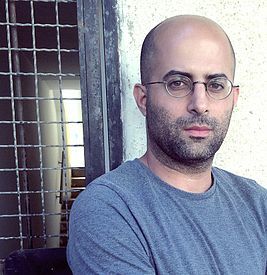 Asaf has also contributed art for the Oscar nominated animation documentary film Waltz with Bashir. His autobiographical comics The Realist started on January 2010, published in Calcalist (Israeli business magazine). It won Gold medal from the Society of Illustrator in 2010 and Award of Excellence from Communication Arts Annual, and silver medal from 3X3. Two collections of the realist pages were published in book form in France on 2012 and 2014 and have been translated to six languages. He has been practicing commercial illustration since 1995. Among his clients are Nike, Inc., Canal+, Rolling Stone, Fortune, The New York Times, Time, The Wall Street Journal, Forbes, PC Magazine, Newsweek, and Men’s Health.